"Haida culture has been wrecked. Their language is gone. Their mythology is gone. The genealogies of the big families are lost. If they're going to find their way back to the world of cultured men, then they have to begin at the beginning." "When Bill Reid began his exploration of Northwest Coast art, he did so as a 'white man' investigating a set of formal design problems. Over the years, perhaps inevitably, his success in unlocking the principles of Coast Indian art have progressively unlocked the Indian in Bill Reid himself." Bill Reid was born in Victoria, B.C., in 1920. 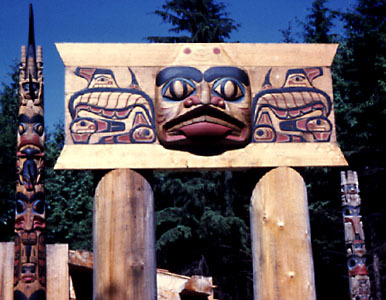 Although in his early years unaware of his Haida ancestry, he was to become perhaps the single most important figure in the late twentieth century renaissance of Haida culture -- a culture almost destroyed after the European colonization of the Haida homeland on the Northwest Coast. To describe him as a "Haida artist" is, however, not to refer to his ethnic background so much as it is to indicate the school of tradition within which he worked. Reid's own upbringing was cross-cultural. 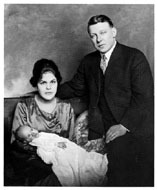 His father William, an American of Scottish-German parentage, followed the newly-built railroad into northern British Columbia, where he ran a hotel in Smithers. His mother Sophie was a Haida but with an Anglican education and consequently anglophile cultural values that led her to hide from Bill his Native descent (nor did his father ever mention it). Shortly after William and Sophie married, he transferred his hotel business to Hyder, B.C., on the Alaska border while she set up house in Victoria, B.C., and made a living as a dressmaker, designing fashionable clothes for upper-crust families of the city. For some years the family moved back and forth between the two locations; Reid received his education in a variety of schools as a result. It was in school, twelve years old and bored, that he made his first forays into craftwork: carving miniature shapes out of blackboard chalk, including a totem pole and a Viking boat. He was not conscious of his Haida heritage until his teens. However, gold and silver jewellery bearing Haida designs, worn by his aunts when they visited Sophie, introduced him unknowingly to the art of his ancestors. Years later, at age 23, he visited his mother's home village, Skidegate, where he met Sophie's father, Charles Gladstone, and other older members of the community who still had some sense of Haida tradition. Reid learned that his grandfather had been a carver of argillite and an engraver of silver bracelets; Gladstone had probably learned these skills from his uncle, the great nineteenth-century Haida sculptor Charles Edenshaw, whose tools he inherited, and whom Reid subsequently adopted as his culture-hero. During the later grades of his education, he acquired a taste for romantic literature, poetry and classical music, but had no introduction to art training. 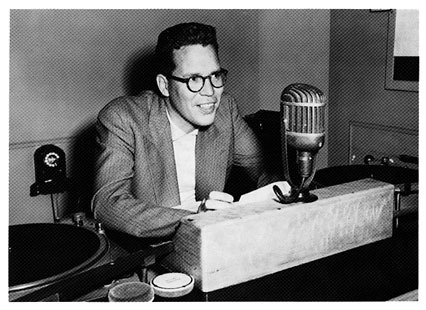 After finishing high school, Reid went into radio as an announcer for local stations in B.C. 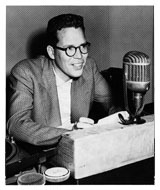 and eastern Canada, eventually ending up with the Canadian Broadcasting Corporation in Toronto in 1948; a modest and unassuming man, he was never quite comfortable with the public aspect of broadcasting. 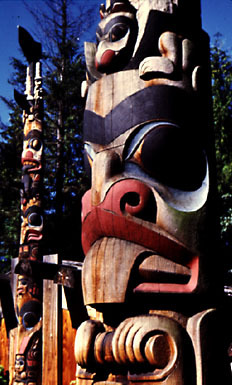 In Toronto he was further exposed to Haida heritage through the Northwest Coast collection in the Royal Ontario Museum, in particular a totem pole from Tanu, the village where his grandmother was born into the Raven moiety; through study of the pole he obtained his first insights into the forms that characterized Haida art. Later in that same year, now in his late twenties, he decided to try to follow in the footsteps of his silversmith grandfather, and enrolled in a jewellery-making course at the Ryerson Institute of Technology, Toronto; he was interested in contemporary jewellery design, inspired by the work of Margaret DePatta. After completing the course, and still working for CBC on the night-shift, he extended his training through apprenticeship at the Platinum Art Company in Toronto. Returning to Vancouver in 1951, he set up a basement workshop for making jewellery between his working hours at the CBC. The West Coast setting rekindled his interest in Haida art and he applied the European jewellery-making techniques he had learned to Haida designs. However, knowledge of the conventions underlying Haida art had been lost; all that remained were the material examples. He set himself to learning that visual language. It was at this time that he began to focus on the works of Edenshaw, which he first encountered -- in the form of two gold bracelets -- at his grandfather's funeral in 1954. 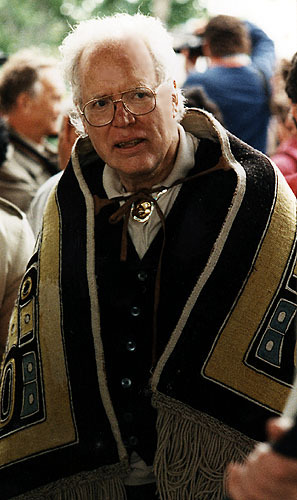 He studied the several hundred pieces of gold and silver jewellery by Charles Edenshaw in museums and copied images from John R. Swanton's Contribution to the Ethnography of the Haida, from Franz Boas' Primitive Art and from books by Marius Barbeau on Haida myths and argillite carvings. Through studying and copying Edenshaw's creations, Reid came to understand some of the fundamental dynamics of Haida art. In the work of Edenshaw, he discovered a living reflection of the Haida culture whose light, by Reid's time, appeared to be almost extinguished. 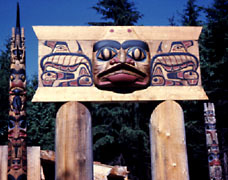 He became involved with totem pole salvage and restoration projects of the Royal British Columbia Museum and the University of British Columbia's Department of Anthropology; through the museum he had his first professional wood-carving experience on a brief stint working with Kwakwaka'wakw master-carver Mungo Martin. In 1958, after reading on-air an item about a UBC Department of Anthropology project to reconstruct a section of a Haida village -- two houses and five poles -- he promptly applied for, and was given, the job, thereupon resigning from the CBC. 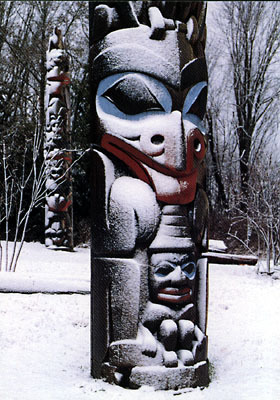 The resulting carvings, through which Reid essentially taught himself the craft of pole-making, were completed in 1962 and are now outdoor exhibits at the UBC Museum of Anthropology.